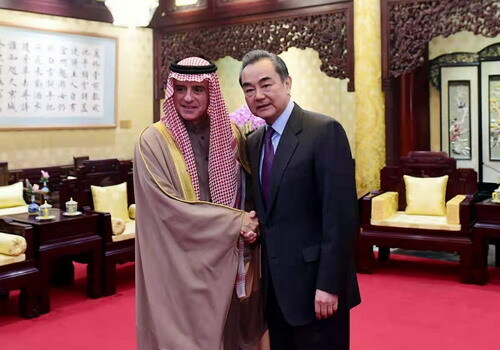 On February 21, 2019, State Councilor and Foreign Minister Wang Yi met in Beijing with Minister of State for Foreign Affairs Adel bin Ahmed Al-Jubeir of Saudi Arabia, who accompanied Crown Prince Muhammad bin Salman Al Saud of Saudi Arabia for the third meeting of the China-Saudi Arabia High-Level Joint Committee in China. Wang Yi expressed that President Xi Jinping paid a successful state visit to Saudi Arabia in 2016, during which the two sides announced the establishment of China-Saudi Arabia comprehensive strategic partnership and the China-Saudi Arabia High-Level Joint Committee, promoting China-Saudi Arabia cooperation in various fields to embark on a fast lane. The important characteristics of China-Saudi Arabia relations are mutual respect, mutual understanding and mutual support. As the current international situation is full of uncertainties, the two sides should make joint efforts to inject more positive energy into the international and regional situation and provide more stability. Wang Yi said that all countries in the world have the right to develop. Saudi Arabia is an emerging market with great potential. The Chinese side supports the diversified development strategy of the Saudi Arabian side, and is willing to strengthen high-tech cooperation with the Saudi Arabian side to jointly embrace the Fourth Industrial Revolution. It is believed that the Saudi Arabian side will continue to provide a fair market environment for Chinese companies. Adel bin Ahmed Al-Jubeir noted that the very stable Saudi Arabia-China relations have achieved rapid development in recent years with fruitful results. China has become Saudi Arabia's largest trading partner. China's development over the past few decades, especially in the field of high technology, has been admired throughout the world. Saudi Arabia regards China as a long-term strategic partner and expects greater development of bilateral relations in various fields including politics, economy and security. China's diplomacy adheres to abiding by international law and non-interference in domestic affairs of other countries, which has played an important and constructive role in peace and stability in Asia as well as the Middle East and the world at large. The Saudi Arabian side hopes to strengthen cooperation with the Chinese side in regional and international affairs. Wang Yi introduced the Chinese side's positive efforts in anti-terrorism and de-extremization, and said that China and Saudi Arabia, both facing threats of terrorism and extremism, should strengthen cooperation and jointly safeguard the security and stability of the two countries and the region. Adel bin Ahmed Al-Jubeir noted that the Saudi Arabian side fully understands and supports the Chinese side's efforts to safeguard its security and stability, and opposes any interference in China's internal affairs.